Both cladogram and phylogenetic tree are two types of evolutionary trees that show the relationship between a group of organisms called taxa. 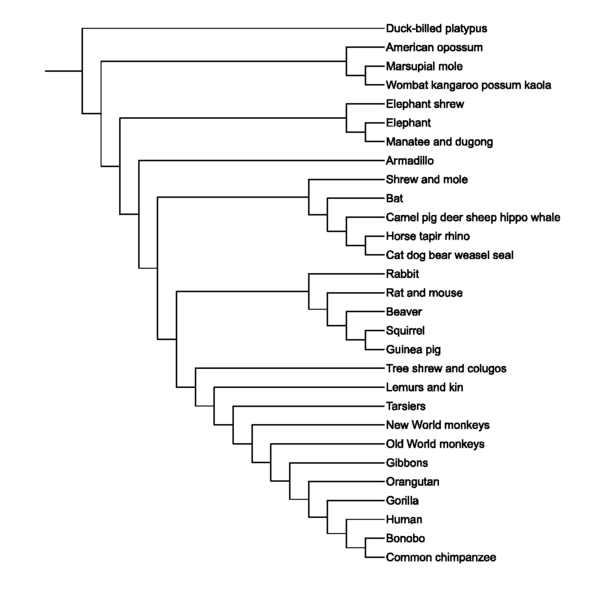 An evolutionary tree is also called a phylogeny. Each branch of the evolutionary trees represents descending taxa from a common ancestor. The nodes on the tree represent the common ancestors of the descendants. The descendants which are separated from the same node are called sister groups. The sister groups are close relatives of each other. A taxon which is separated from a common ancestor is called outgroup. The main difference between cladogram and phylogenetic tree is that cladogram is an evolutionary tree with branches with equal distance, showing the relationship between a group of clades whereas phylogenetic tree is an evolutionary tree showing an estimate of phylogeny where the distance of the each branch is proportional to the amount of inferred evolutionary change. A cladogram is a branching diagram which shows the evolutionary relationship among a group of clades. A clade is a group of organisms, comprised of all the evolutionary descendants of a common ancestor. A cladogram does not depict the amount of evolutionary change in the group, nor does it indicate the evolutionary time or the genetic distance. Each branch of the cladogram ends with a clade. It starts from a last common ancestor. Cladograms are usually formed based on the morphological characters. A cladogram showing the relationship between mammalian species is shown in figure 1. A phylogenetic tree is a branching diagram which shows the inferred relationship between various biological species. The distance of the branches in the phylogenetic tree represents the amount of inferred evolutionary change. In order to generate a phylogenetic tree, several characteristics like external morphology, internal anatomy, biochemical pathways, behavior, DNA and protein sequences, as well as the evidence of fossils have to be used. But, phylogenetic trees are hypotheses and do not indicate the exact relationships. The data obtained from DNA sequencing increases the reliability of the relationships in the tree. The phylogenetic tree of life is shown in figure 2. Both cladogram and phylogenetic tree are evolutionary trees. They represent the evolutionary relationship between a group of organisms. The designing of both cladogram and phylogenetic tree is basically based on the morphological characteristics of the organisms to be depicted. Cladogram: Cladogram is a branching diagram showing the relationships among a group of clades. Phylogenetic Tree: Phylogenetic tree is a branching diagram showing the inferred relationship between various biological species based on the similarities and differences in physical and/or genetic characteristics. Cladogram: The shape of the cladogram shows the relatedness among a group of organisms. 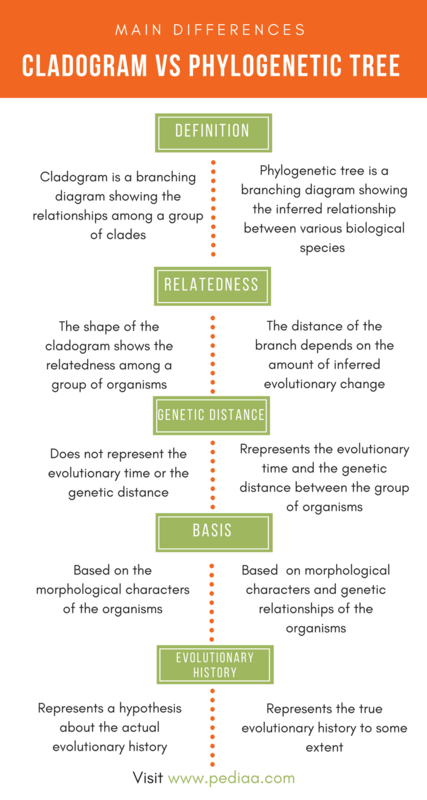 Phylogenetic Tree: The distance of the branch depends on the amount of inferred evolutionary change. Cladogram: Cladogram does not represent the evolutionary time or the genetic distance. Phylogenetic Tree: Phylogenetic tree represents the evolutionary time and the genetic distance between the group of organisms. Cladogram: Cladogram represents a hypothesis about the actual evolutionary history. Phylogenetic Tree: Phylogenetic tree represents the true evolutionary history to some extent. Cladogram: Cladogram is based on the morphological characters of the organisms to be depicted. Phylogenetic Tree: Phylogenetic tree is based not only on morphological characters but also genetic relationships of the organisms to be depicted. Cladogram and phylogenetic tree are two types of evolutionary trees, showing the relationship between a group of organisms. Cladograms are basically based on the differences in the morphological characteristics of the group to be depicted. Hence, a cladogram is a hypothetical diagram. In contrast, phylogenetic trees are based on the genetic relationships between the organisms. 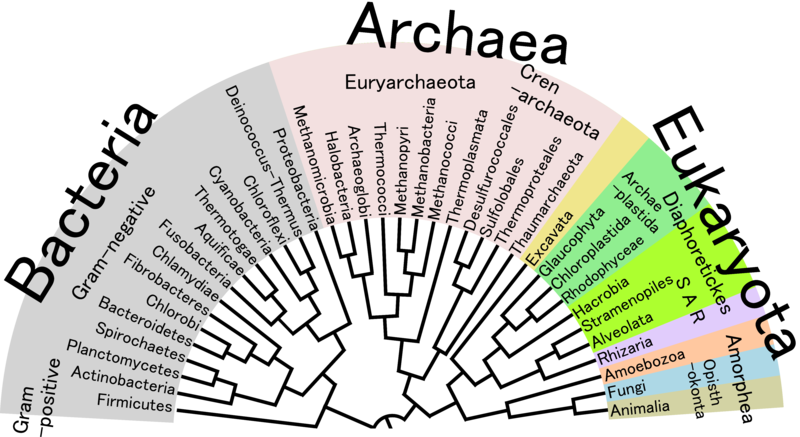 Therefore, a phylogenetic tree shows a true evolutionary history in organisms to a certain extent. Hence, the main difference between cladogram and a phylogenetic tree is in their extent of describing evolutionary history. 1. “How Does a Cladogram Reveal Evolutionary Relationships?” Cladogram Analysis. N.p., n.d. Web. Available here. 05 June 2017. 2. “Reading a Phylogenetic Tree: The Meaning of Monophyletic Groups.” Nature News. Nature Publishing Group, n.d. Web. Available here . 05 June 2017. 3. “Phylogenetic trees.” Khan Academy. N.p., n.d. Web. Available here . 05 June 2017.